There is no Internet access. Adobe Acrobat Reader is installed on both systems. Office 2016 (PC) will be used at this workshop. A Microsoft Windows based PC with Windows 10 and PowerPoint (Microsoft Office 2016 version) will be provided. An Apple Macintosh will be provided with OS X (El Capitan 10.11), PowerPoint (Microsoft Office 2016 version) and Keynote (El Capitan version 6). Installation of any additional software will not be permitted. Since there is only one PC and one Mac, it is not possible to load once the session has begun. You must use the provided computers. There will be no connection to use your own laptop at the lectern. Therefore, we strongly encourage you to load your PowerPoint presentation as early as possible. There is no speaker ready room. The loaded version does not need to be your final version. Draft versions can be loaded and later updated. You can simply test the fonts, animations, and videos and then bring your final version in during your scheduled time. By loading a draft version, any potential issues can be discovered and corrected prior to presentation. Since editing time will be limited, please ensure that all fonts appear as expected and all sound/video clips are functioning properly. The A/V staff will start each presentation. Once the presentation is launched, you will control the presentation from the lectern using a standard computer mouse. The left button will advance to the next slide and start movies. The mouse will also function as the pointer. No laser pointers are provided. The sessions are digitally captured and a laser pointer cannot be recorded. There will not be a keyboard. If you do not want the mouse pointer to disappear during their presentation, please consult the A/V staff when loading. This workshop will use a 16:9 format screen [rectangle] and HD which can support a wide screen format. To use the widescreen format, change your PAGE SETUP setting before creating your presentation. The default setting is ON-SCREEN SHOW (4:3). A widescreen presentation will have to be changed to ON-SCREEN SHOW (16:9). Changing the setting after the presentation has been created can cause format issues on slides. If you bring a 4:3 formatted presentation to a workshop using 16:9, it will still work. The projected image will look correct, but there will be black bars on both sides of their image (filling in the blank space). For PC based PowerPoint presentations, we request you use only MPEG4 (.MP4) or Windows Media Video (.WMV) videos. For Mac based PowerPoint presentations, we request you use only MP4 or a QuickTime movie (.MOV) files. For QuickTime movies, use the H.264 CODEC for video and AAC for audio (if any). AVI and MPG videos are strongly discouraged. If using a video file, it is imperative that it is tested as early as possible to ensure it will play on the provided computers. If a video does not play on the provided computers, it may take hours to fix, if it can be fixed. Please note, just changing the file extension does not convert the file. Both free and commercial software is available for that purpose. The presentations are captured and to prevent an accidental ending of recording, we ask that you LOOP your presentation. This option can be found under the SLIDE SHOW -> SETUP SLIDE SHOW menu in PowerPoint. Web address and e-mail addresses may contain HYPERLINKS. If you have either one, please highlight the text and REMOVE HYPERLINK. An accidental click on this could interrupt your presentation. Office 2007 and all subsequent versions allow the embedding of True Type fonts. When saving your version that will be used for presentation, please choose SAVE AS then select TOOLS then SAVE OPTIONS then EMBED FONTS IN FILE and select EMBED ALL CHARACTERS. Content of CME activities will be restricted to pure science, industry issues and operation of devices, and should not include any advertising, corporate logos, trade names or a product group message of an ACCME-defined Commercial Interest. Presentations must give a balanced view of therapeutic options and use of generic names will contribute to this impartiality. Trade names or company names should only be used if essential. If included, where available trade names from several companies should be used, not just trade names from a single company. A traditional poster presentation combines a visual display on a poster board of the highlights of research with a question-and-answer opportunity. You will be assigned a time period during which you should be present at your poster for discussion and questions. In addition, the poster will be available for viewing by attendees during all hours the workshop is open. A PDF of your poster will be archived on the workshop website. Instructions for archiving your PDF will be provided. Each presenter is assigned a square space which measures 36 inches (91.44 cm) wide and 36 inches (91.44 cm) high. 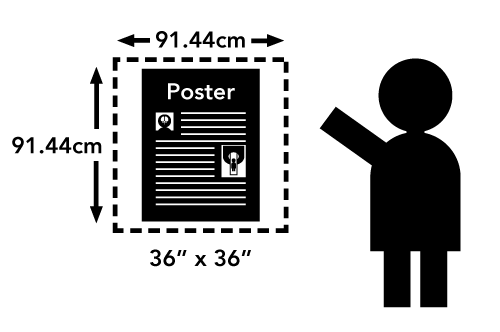 Posters exceeding these measurements and extending into areas reserved for other posters may be removed. Posters will be attached to their spaces with either double sided tape or push pins, which will be provided at the workshop. The poster should show the full title of your submission. The text should include (most likely as separate elements of the poster) your hypothesis, methods, results, and conclusions. For best legibility, it is suggested that the title lettering be at least 2 inches (5cm) high, with authors' names and affiliations smaller. All lettering should be legible from a distance of approximately 5 feet (1.5m). It is suggested that font size should be at least 24 point, in bold style. The typeface chosen should be a simple and clear one (e.g., Helvetica). Titles should be in all upper case letters. The remainder of the text should be in a combination of upper and lower case letters. Color should be used sparingly, to provide contrast. The featured parts of the poster can be highlighted with warm colors, and the less important parts can be done in cool colors. Some suggestions for color combinations are as follows: Green on white, red on white, black on white, blue on white, white on blue, and white on black. Photos should be enlarged enough to show relevant detail. Standard computer printouts usually are not effective on posters, because the type is too small and the lines are too thin to be seen from a distance. Patient confidentiality must be protected. No names should appear in illustrations.